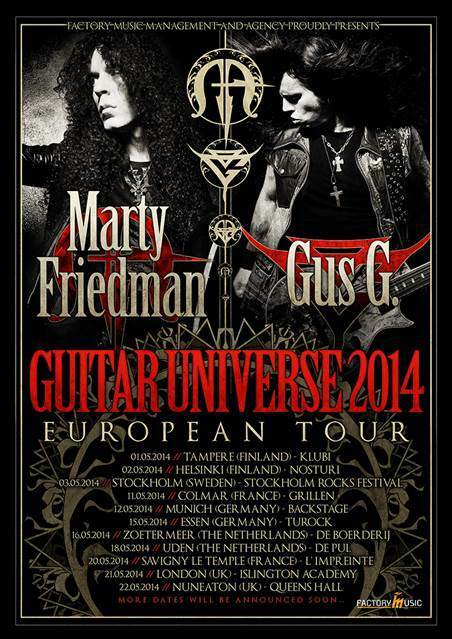 Fan-filmed video footage of Marty Friedman (ex-MEGADETH) and Gus G. (FIREWIND, OZZY OSBOURNE) performing a cover version of the BLACK SABBATH classic "Symptom Of The Universe" on May 1 at Klubi in Tampere, Finland during their "Guitar Universe 2014" European tour can be seen below. Friedman's new solo album, "Inferno", will be released in late May via Prosthetic Records (except in Japan, where the album will be made available through Universal Music). "Inferno" was recorded primarily in Los Angeles with engineer Chris Rakestraw (DANZIG, CHILDREN OF BODOM) and mixed by Jens Bogren (OPETH, AMON AMARTH) — features what Friedman recently told Guitar World is "the most intense writing and playing I can do." 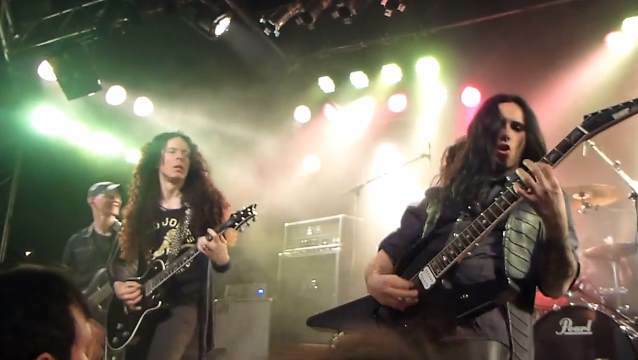 The album also includes notable guest appearances by several artists influenced by Friedman, including flamenco/metal acoustic guitar duo RODRIGO Y GABRIELA, CHILDREN OF BODOM frontman Alexi Laiho, SKYHARBOR mastermind Keshav Dhar and REVOCATION guitar whiz David Davidson, as well as Friedman's first songwriting collaboration with Jason Becker since the pair played together in CACOPHONY, the pioneering duo of guitar mayhem. In addition, "Inferno" breaks all genre rules and creates new ones with an exhilarating and musically daring mash-up with Jørgen Munkeby of the acclaimed "blackjazz" act SHINING, as well as two tracks featuring vocals by rock guru Danko Jones. Overall, "Inferno" is by fa Friedman's most thrilling and adventurous effort to date. Gus G.'s debut solo album, "I Am The Fire", entered the official chart in Greece at position No. 27. The CD sold around 700 copies in the United States in its first week of release. The cover artwork was designed by Gustavo Sazes (ARCH ENEMY, KAMELOT, DREAM EVIL). Gus handles all guitar, bass and keyboards on "I Am The Fire", and is joined by a roster of friends and guests that help bring his vision to fruition: drummers Jeff Friedl (A PERFECT CIRCLE, PUSCIFER, DEVO) and Daniel Erlandsson (ARCH ENEMY), bassists David Ellefson (MEGADETH), Billy Sheehan (MR. BIG, DAVID LEE ROTH) and Marty O'Brien (TOMMY LEE, WE ARE THE FALLEN, LITA FORD), and vocalists Mats Levén (CANDLEMASS, ex-YNGWIE MALMSTEEN, THERION), Blake Allison (DEVOUR THE DAY), Michael Starr (STEEL PANTHER), Alexia Rodriguez (EYES SET TO KILL), Tom S. Englund (EVERGREY), Jacob Bunton (ADLER) and Jeff Scott Soto (TRANS-SIBERIAN ORCHESTRA, TALISMAN, ex-JOURNEY, YNGWIE MALMSTEEN). "I Am The Fire" was mixed by Jay Ruston (ANTHRAX, STONE SOUR, STEEL PANTHER) and was recorded between Los Angeles and Gus' home country of Greece through the latter half of 2013. A few of the album's tracks include "Eyes Wide Open", "Redemption", "End Of The Line" and "Blame It On Me". The album showcases a well-balanced mix of active rock, classic hard rock, traditional metal and guitar-driven instrumentals, taking listeners on a diverse journey and opening doors to Gus G.'s soulful playing.